You can't help but smile while living in this light and bright floor plan. 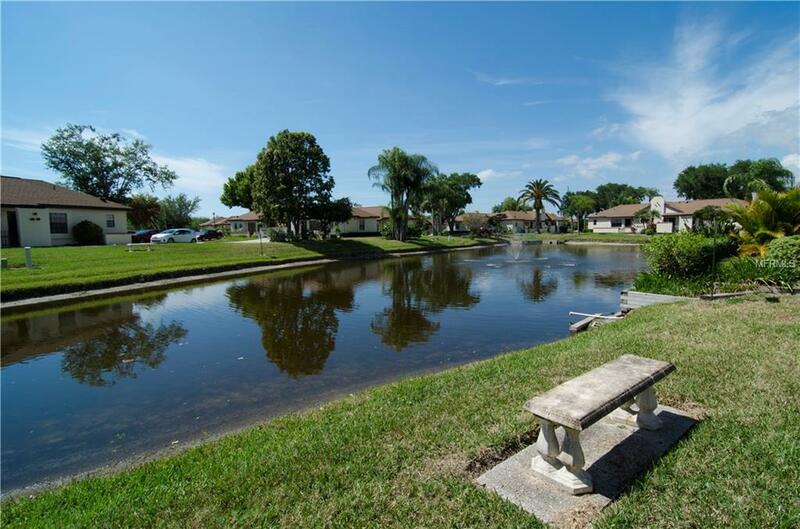 What a great layout in this 2 bedroom, 2 bath villa with a relaxing view of the pond and beautifully kept grounds. This unit is situated to offer privacy on both sides with the entry patio facing the pond and a separate screened lanai in the courtyard. This unit is nicely updated with fresh paint, laminate and tile flooring, new wood cabinets with soft close drawers and Solid Surface counter tops. Enjoy the convenience of this maintenance free community, just minutes from shopping, dining, boating and several beaches on the Gulf of Mexico! There are a dozen golf courses within as many miles! Bring your swim suit, golf clubs and flip flops! The furniture is available for purchase under a separate agreement. Pet Restrictions The Owners Of The Unit May Have Pets But Any Renters Of The Unit May Not.